What this book needs is more orcs. Or any orcs at all, really, but preferably a great horde of slavering, rampaging, hell-bent-on-destruction orcs. Failing that, zombies would do the trick. Or perhaps we could push swords into the characters’ hands and toss them into the gladiator arena. Frankly, they need something of the sort. A post-apocalypse world to shake them out of their fairyland and give them something serious to worry about. Because I’ve never come across such a snivelling bunch of whiny, self-absorbed morons who so badly need to just get over themselves. Here’s the plot, such as it is. Matriarch Lydia has just died, and son Edmund returns to the family home wherein reside his brother Otto and his wife Isabel, along with Otto’s apprentice and his sister, and the resident nanny-turned-housekeeper, the eponymous Italian girl. The story then unfolds with one melodramatic revelation after another, accompanied by much shouting, gesturing, grand speech-making, falling down, weeping and wailing, and running about in the rain. There isn’t one of them who seems to have an ounce of common sense, or any idea of just how lucky they are not to be working in a factory or down the mines. OK, OK, so I don’t get it. I probably lack the right receptors in my brain to get the point of a book like this. No doubt there are complex nuances of language or literature or philosophy or metaphor that simply whizzed over my head. I’m missing the point, I accept that. But it was short, and I finished it, so I gave it two stars. 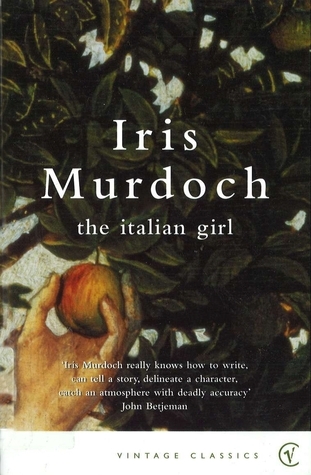 In future I shall leave Iris Murdoch to those better suited to appreciate the qualities of her writing. You’d think that adding orcs and zombies would brighten up any story, but I tried to read Pride and Prejudice and Zombies and it was just…uuuuugh. Not my thing, I guess. And if there was so much falling down in this one, probably all the characters would have been eaten in short order. Which…might have been an improvement?